I have been a fan of Sherlock Holmes since my early teenage years. I remember having studied a small piece of his writing for a mock-examination at school. The only thing I can recall about it was that it was an excerpt from Arthur Conan Doyle’s first Sherlock Holmes book ‘A Study in Scarlet’ (first published in book form in 1888). The small section contained a detailed description of the exterior of a house, and something to do with sickly-looking laurels… The evocative title alone caught my attention, as I am also a big fan of Cluedo (a Miss Scarlett connection) and being an artist, colour names rather get my attention at first glance. Years later, a ‘Study in Scarlet’ (stored away in my memory banks), I saw a small piece of the movie ‘The Hound of the Baskervilles’ starring the renowned Basil Rathbone, as Conan Doyle’s legendary sleuth… The story grasped me with its twist on a typical Gothic horror mystery, with a large and glowing hound striking fear and causing death to the noble Baskerville family, living in Dartmoor. Later still, when I was studying, what was to be 5-years of graphic design qualifications, I became more familiar with the name of Baskerville, as it is a traditional serif typeface, which is popular to this day. I liked the font because of the Sherlock Holmes connection and it has become one of my all-time-favourite fonts. With or without its connection to one of my sleuthing heroes, it is a fine font and one that I use fairly frequently in my work… Having started my career exactly one-hundred-years after the publication of ‘A Study in Scarlet’, it is rather appropriate that my fondness for this font remains strong. The font, which is easily recognised for its distinctive swash tail on the uppercase Q, was designed by a writing master, John Baskerville (1706 – 1775). His evergreen typeface also shows some beautiful cursive serifs in its italic form. 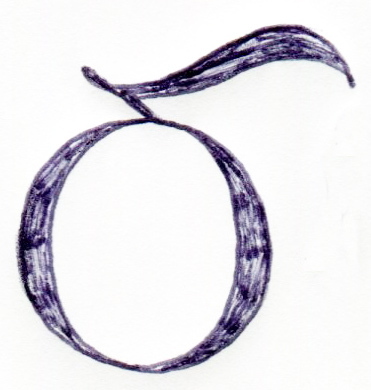 The capital letter Q is unique among typefaces, as it is longer than its body width and cups the following letter.